Now that regular incandescent light bulbs are a thing of the past and LED’s and CFL’s are the new “go to” light bulbs, what can you expect your house to look like? The reason I am asking this question is because the colors in your home are going to appear differently than they do under good, old fashioned incandescent lighting. This is because of something know as CRI or Color Rendering Index, a scale of 0-100 where incandescent light bulbs are at the top of scale, 100. Different light source have different CRI’s, all of which are compared to incandescent light bulbs, but non of which are equal to incandescent. 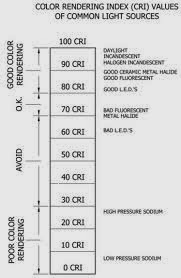 Fluorescent and LED light sources vary in CRI between about 75 to about 85 with some LED’s approaching 90. Therefore things are going to look different depending on the CRI of you light bulb. Note the picture of the fruit and vegetables above. For most purposes, a CRI of 85 is considered good enough in residential applications. This chart lists different light sources and their associated CRI values. At the bottom of the list is Low Pressure Sodium, a light source that was primarily used in highway lighting in the past. With this kind of lighting, a police officer could not tell the difference between blood and oil at an accident scene. CRI does make a difference! New light bulb labeling laws are useful in selecting the correct light bulb with a satisfactory CRI. Please see this label and note that in addition to other important information the CRI value is shown as “Color Accuracy”. Please be advised that higher CRI’s require a higher standard of manufacturing. In a fluorescent light bulb more expensive phosphors must be used and in LED’s higher quality computer chips must be used. Therefore you can expect to pay more for better quality light. There is no right or wrong, just be sure you understand the differences. Visit the App Store and download the UL app, LightSmart, for all kinds of great information. And please visit FoggLighting.com and like us on Face Book. I am often asked about the proper size of a lighting fixture so when I saw this article in “Residential Lighting” magazine I decided to share it with you. Randall Whitehead is a regular contributor to the magazine. Helpful advice for calculating proportional decorative lighting based on a room’s dimensions. 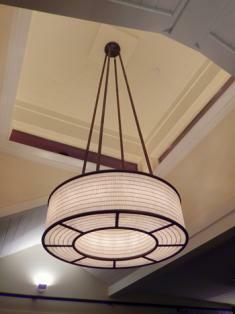 Q: What is the rule of thumb for determining the size of a chandelier or pendant fixture for a given space? I have a 25-by-30-foot area over a stairwell and I don’t want too large or too small a fixture. If you could help me out, it would make me very happy. A: Just think of me as verbal Prozac. Try this formula: Add the dimensions of the width and length of the foyer area together. This number will be the measurement in inches what the width of your fixture should be. Based on the dimensions that you have given me, I think you should be looking at a chandelier that is 55 inches in diameter. The length will be a little bit harder to determine, as it depends on the ceiling height. Taller ceilings can take longer fixtures. Somebody in your family or your contractor could make a mock-up out of wooden dowels and strings to get a feel for what the fixture would look like in the space. Randall Whitehead, IALD, is a professional lighting designer and author. His books include “Residential Lighting, A Practical Guide.” Whitehead has worked on projects worldwide, appeared on the Discovery Channel, HGTV and CNN, and he is regular guest on Martha Stewart Living Radio. Visit his website www.randallwhitehead.comand follow his blog www.lightmakesright.comfor more information on books, upcoming seminars and the latest lighting trends. Please visit www.fogglighting.com and like us on Face Book. Be sure to download the free UL app, “LightSmart” from the app store for lots of good lighting information. The following story appeared in the Wall Street Journal on Saturday, September 28. I pass this along to you because it is an example of how LED technology is becoming more popular. Piercingly bright yet implausibly small, light-emitting diodes—or LEDs, to use their somewhat catchier nickname—are having an outsize influence on interior design. These energy-efficient light sources, which require a fraction of the electricity of incandescent and even the much-loathed compact-fluorescent bulbs, aren’t just giving stressed-out environmentalists reason for optimism. They’re also freeing designers to reinvent lamps—and light itself—in ways that once seemed impossible. Here are five talking points about this game-changing light source that you’ll want to memorize in case you attend a cocktail party entirely populated by futurists, or just want to know how LEDs are going to affect your living room, your kitchen and the way you read yourself to sleep. LEDs are tiny and thin—often about the width of a pencil eraser—which is letting designers give all sorts of light fixtures a nip and tuck. Take, for example, the old-school banker’s lamp, typically a rather hulking presence. By replacing the standard bulb with a slender strip of warm white LEDs, Ron Gilad created a sleeker version, his Goldman lamp for Flos. Given the petiteness of LEDs, he was able to replace the traditionally bulky shade with a sliver of injection-molded plastic and considerably whittle down the brass base, since it no longer needs to support a hefty top. His lamp reads like a suit tailored for a particularly slim banker. “If we were using an incandescent bulb, we would not be able to reach the same level of minimalism,” said Mr. Gilad. The coolness factor is also contributing to the continuing slenderization of lamps. The shade of Flos’s Goldman, for example, sits very close to the light source, mainly because it can. And while Isamu Noguchi’s circa-1950s paper lanterns—voluminous, semirigid globes—were designed to keep the paper far away from the incandescent bulb, the soft shade of their intricately folded descendant, Issey Miyake’s new LED-equipped Mendori, can be stretched or compressed like an accordion, coming into proximity to the bulb with little risk of combustion. LEDs’ energy efficiency may please the eco-conscious and the environmental regulators, but the lights’ meager appetite for electricity also offers a distinct aesthetic advantage: It allows wires to be thinner and less thickly insulated. With certain LED chandeliers, the power cord is indistinguishable from the thin cables suspending the fixture from the ceiling. The word “floating” is frequently invoked. This characteristic is also letting designers embed LEDs in paper-thin materials, creating wallpaper, for instance, that’s studded with dim points of light. In such cases, the “wires” have been reduced to a very thin conductive material. To create its Abyss wallpaper collection, released this month, London-based Meystyle applies the material by hand; Ingo Maurer’s LED Wallpaper goes a step further: A conductive ink is printed directly on the paper. The ease of powering LEDs also allows designers to “daisy chain” lights—kind of like attaching one string of Christmas tree lights to another. Luceplan took advantage of this when creating its Synapse system, a module-based approach to room dividers. Each star-shaped piece, illuminated by a color-adjustable LED, snaps together with the next, providing electricity to the others connected to it. The result: a glowing web of stars that can subtly divide a living room from a dining room. Perhaps the most powerful new tool that LEDs offer lighting designers is the ability to adjust the color temperature of white light. A controllable feature known as “dynamic white” offers almost as many minute variations on paleness as Benjamin Moore does with paint. For one client with a windowless room, Ms. Tillett set a dynamic white LED on a timer to cast a pure, sunlight-like glow early in the day that gradually became more golden in the afternoon. “Particularly in windowless rooms, it allows you to create a sense of the passage of time,” she said. Although this feature is primarily available in products aimed at architects and interior designers, it is trickling down to the consumer level. Luceplan’s Curl lamp, for example, has a phosphorous lens that lets you shift the color temperature of the 8-watt lamp from a warm 2400K to a cooler 3500K by twisting a dial. Innovation is accelerating. “In the past, there were only three or four good suppliers of traditional light sources in the world,” said Mr. Gandini. But because of LEDs’ overlap with the semiconductor industry, he added, a wide range of electronics companies, especially in Asia, are now manufacturing them—and each is contributing its own ideas on how light and electronics can be integrated. 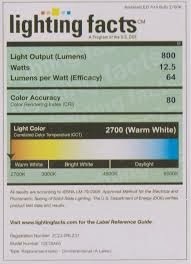 Please visit us at www.fogglighting.com and be sure to call with all your lighting questions and needs.